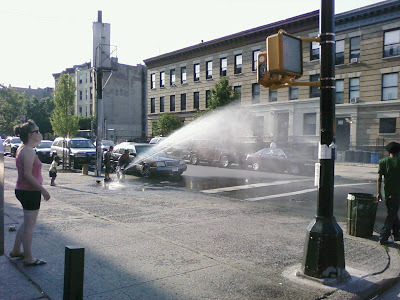 Nothing makes a hot evening run in 89-degree weather feel better like an open hydrant to run through! One other note: when I took this photo last year, I was the only person taking it, at least at the time. This time, I was trying not to wander into the shots of at least two other people with cameras, and that was in the 10-second window in which I walked by. Meanwhile, get your weekend started with two great events this Friday. From 7:00-8:30, Force and Flow hosts their monthly Sound Bath, an immersive music-therapeutic event featuring (this month) The Didge Project. In unrelated but equally interesting news, Force and Flow instructor Ophra currently has a fun project going called "Dress a Day," which she's documenting on her blog, Stories of O. Up the block at LaunchPad, the fun starts at 8:00 with a collaborative performance featuring The Dymaxion Quartet and photographer Asca S.R. Aull. The jazz quartet will be unveiling new work from their upcoming album "Sympathetic Vibrations," which will feature nine original compositions based on Aull's work. The event runs to 11 and is free (BYOB), with donations for the artists accepted. So get out this weekend and show everybody that Franklin Avenue is about more than just violence! 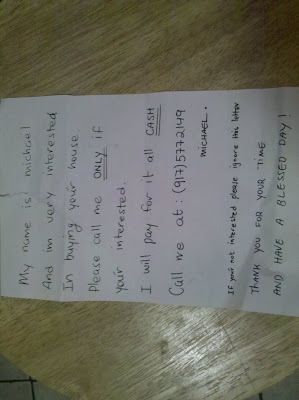 My buddy over on Washington found this on the door of his house, and the doors of every house on his block. Apparently someone is still looking to cash in (or cash out) on the housing crisis. 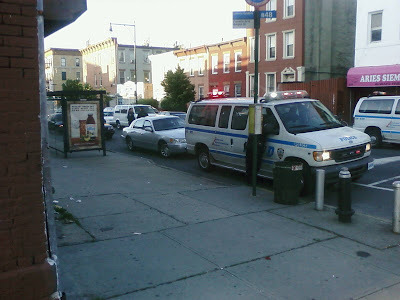 First, longtime resident and local blogger Brooklyn Born was mugged last weekend, and has an insightful post up here. 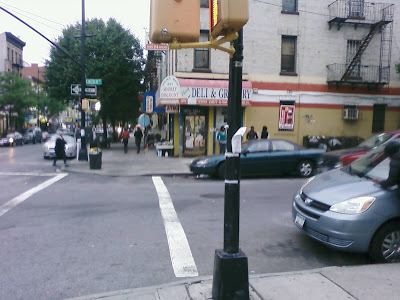 I don't care who you are, being mugged is f--king awful (it's an experience I've shared, though thankfully not on these particular streets), and I salute Brooklyn Born for having the courage to post about it, and make a positive contribution to the ongoing dialogue about crime in the area, so soon after the fact. Secondly, Susan Boyle (no, not her) posted this excellent comment today recommending that we all get on the phone to the 77th Precinct and let them know we want this crime wave addressed. I should add that contacting local pols (did anyone get to Councilwoman James's Informational Meeting tonight?) is another good way to encourage people with power to invest in keeping our neighborhood safe. 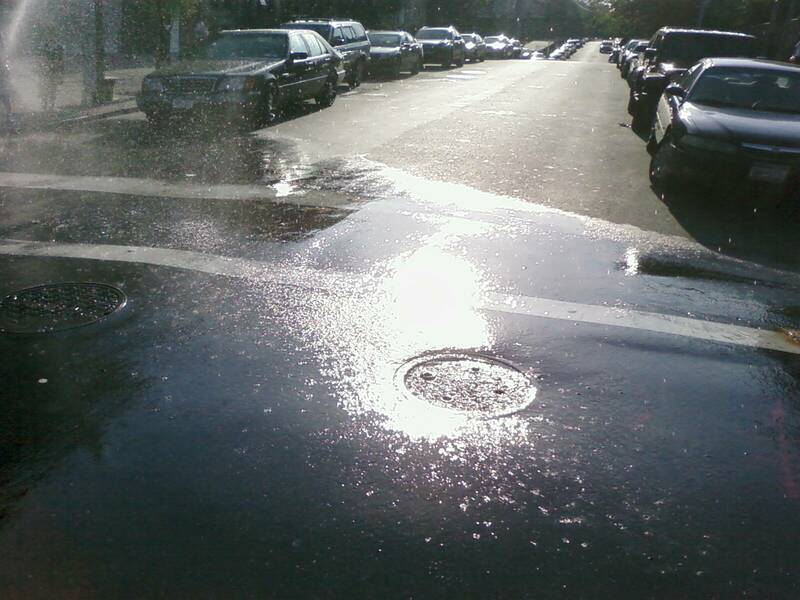 I found last week particularly challenging as a resident of Franklin Avenue and a blogger trying to do right by whatever small measure of information I provide. Thanks to all who posted, including those who were attacked during this high-stress period (I don't know what I'd have done on Saturday if I'd been shot at from a rooftop with a water pistol, much less with a BB gun). Thanks in particular to Nat for emphasizing the importance of seeing the bigger picture and not reducing the incident to a gangland shooting. Apologies to Sue Rock and Ophra at Force and Flow, both of whom had great events last weekend that I forgot to run because I was too fried from the week to post anything beyond a dumb joke on Saturday. There are more great events coming up that I'll be posting about tomorrow, I promise. On the A train, coming home, I doze and the lady lets me rest my head on her shoulder. It’s a long ride from Inwood, but I sleep almost the entire way, waking once at Columbus Circle when an irate man boards the train screaming at his companion, gesturing wildly and threatening violence. I nod back off, but the lady watches, and makes eye contact just as he raises his shirt to show his companion the handgun tucked in the waistband of his jeans. She looks down hurriedly, but he knows she saw it, and to keep her from saying something (having seen something), he ambles over and stands above us, clasping the aluminum rail and glowering down at her. Oblivious, I snore on, until a screeching stop a Jay Street wakes me. “Hey you,” she says, “let’s get off at Lafayette. I want to go to Target.” I shrug, and we get off at Lafayette, where I promptly get a talking-to for being the worst knight in shining armor ever. I shrug again. What could I have done? All of this is prelude to an encounter at MoCADA, the Museum of Modern Contemporary African Diasporan Arts, which we pass on our walk. I poke my head in and discover that this is the last day of their much-discussed show, “The Gentrification of Brooklyn: The Pink Elephant Speaks,” a show I told myself I would get to, an exhibition I wanted to think about. “I’m not feeling up to it right now” says the lady, and heads for Target. Inside, three works affect me. The first is a film in which a young woman of the African Diaspora talks confidently on her Bed-Stuy stoop about the effects of neighborhood change. “We’ve been in this building for fifty years, this is our building, and they’re trying to force us out, raise the rents, so new people can move in.” She wears an Assata Shakur t-shirt. 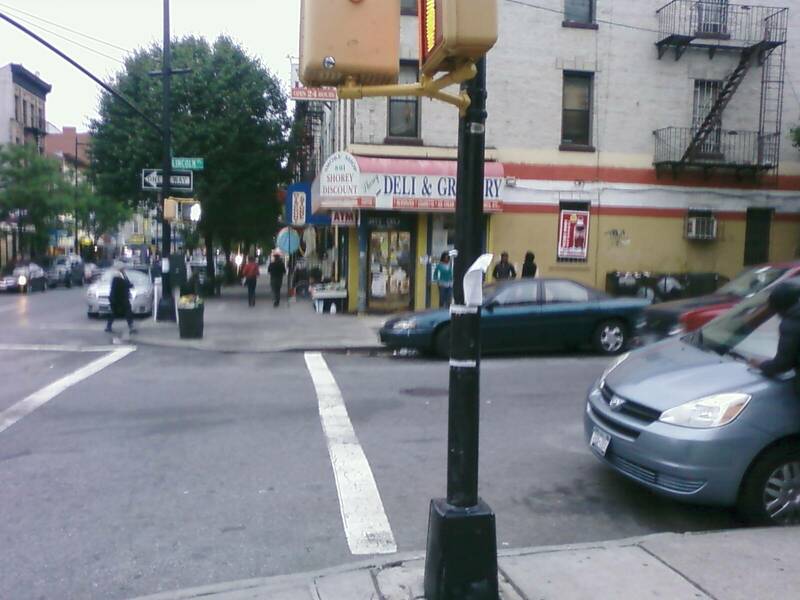 “We used to know everyone on this block. People would be outside grilling, kids playing, everyone talking to everyone. People move in, and they’re nasty to us, and then the police come around, talking about noise complaints, which we never had before. Now there’s no one out on the block anymore.” She is angry and articulate. This is her neighborhood, her stoop, and forces she cannot control are destroying it. But who’s talking to who? Locals to newcomers? Newcomers to other newcomers? Black to white? And why? The third piece, a triptych by Queens artist Oasa DuVerney, is the hardest to absorb, the most searing. In the middle panel, an exaggerated gold chain three feet high holds a big gold skull and crossbones, with eyes large enough to hold sketched images of an older woman (in one eye) talking to a younger woman (in the other). To the left, a large panel holds a disturbing vision of a black woman screaming, her hair being pulled, her arms twisted behind her back. She is drawn gesturally and vividly, while her aggressors, two police officers, are outlined, emotionless, figures from a graphic designer’s drafting table. Underneath them, in flashy, motorcycle-gang script, runs the caption, “Remain Indifferent.” The rightmost panel reads “Remember They Are Indifferent.” The image is of drinkers at Franklin Park (the sign in the garden visible behind them), all outlined. This is an indictment. Indifferent? We are indifferent by virtue of our difference? Can I beg to differ, to not be indifferent? We'll search for tomorrow (and secondhand t-shirts) on every shorrrrrrrrrrrrrrrrrrrrrrrree . 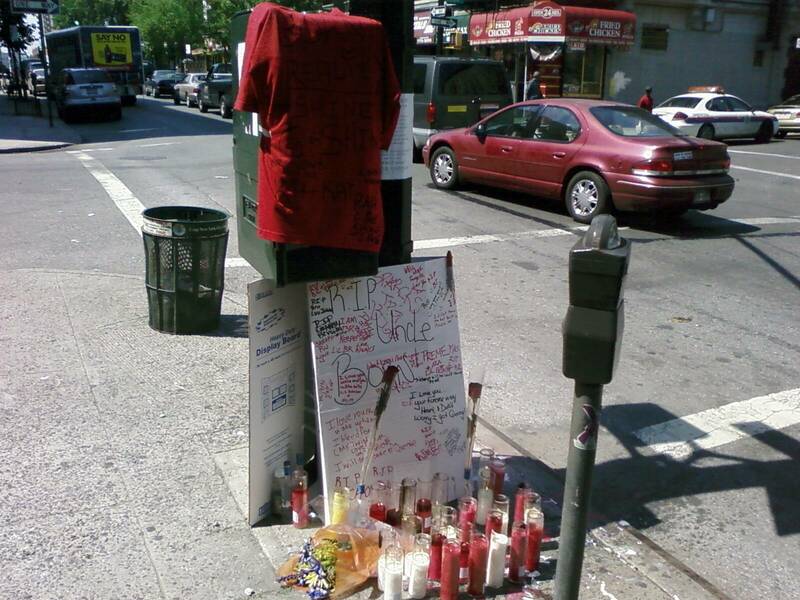 . .
A memorial gathered around the lamppost at Franklin and Lincoln over the past two days, along with posters from Save Our Streets Crown Heights, an anti-violence program of the Crown Heights Community Mediation Center. Meanwhile, many local residents attended an emergency town hall meeting, covered here by the Brooklyn Eagle. May their efforts not be in vain. Note: this message appeared as a comment in the previous post, but I felt it deserved to be reproduced here. 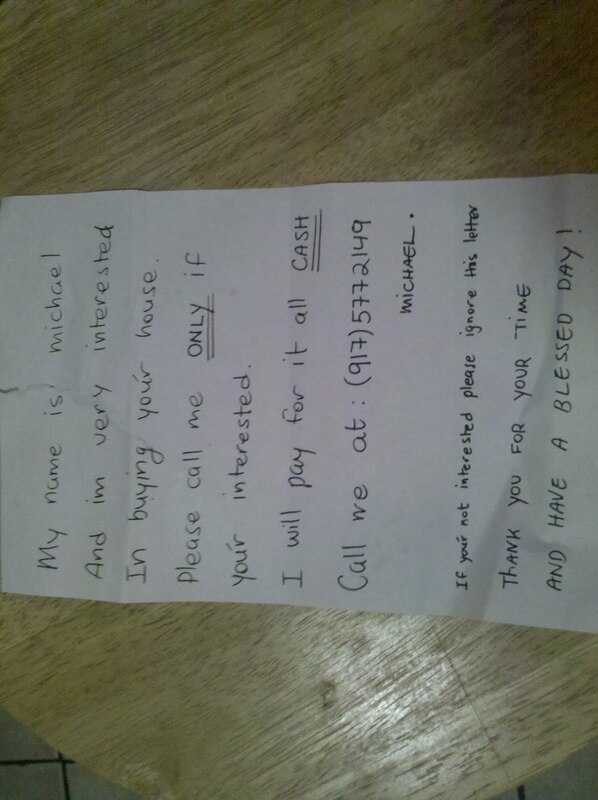 I have no way of verifying it, but I want to believe that someone wouldn't make up such a thing. 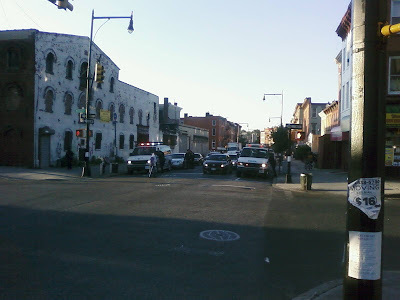 I'm not breaking this news, but a man was murdered in a point-blank shooting this morning at 11AM on Franklin and Lincoln, as reported on Gothamist and SaveBrooklynNow. Gothamist talked to someone at the scene who overheard neighbors saying the dispute was about a woman, but a person familiar with the investigation said that the NYPD now believes the incident was drug-related. While there are no official suspects yet, the police have acquired surveillance video of the event that identifies the shooter, who was recognized as an individual involved with the local drug trade. On Brooklynian, one poster referred to Franklin and Lincoln as "the drug dealing/sexual harassment/violence capital of Franklin," while others worried about escalating violence this summer. While its true, as another poster mentioned, that the vast majority of these shooters don't target strangers, flying bullets remain dangerous, as the Sushi Tatsu deliveryman who was hit in a drive-by last summer can attest. What the police response will be (Franklin's already an impact zone, but I suppose they could bring back the Skywatch) remains to be seen. This update just in from the Crow Hill Community Association meeting--Walgreens, the Chicago pharmacy giant that bought Duane Reade earlier this year, is apparently considering becoming the ground floor tenant at Franklin and Eastern (the giant hole). 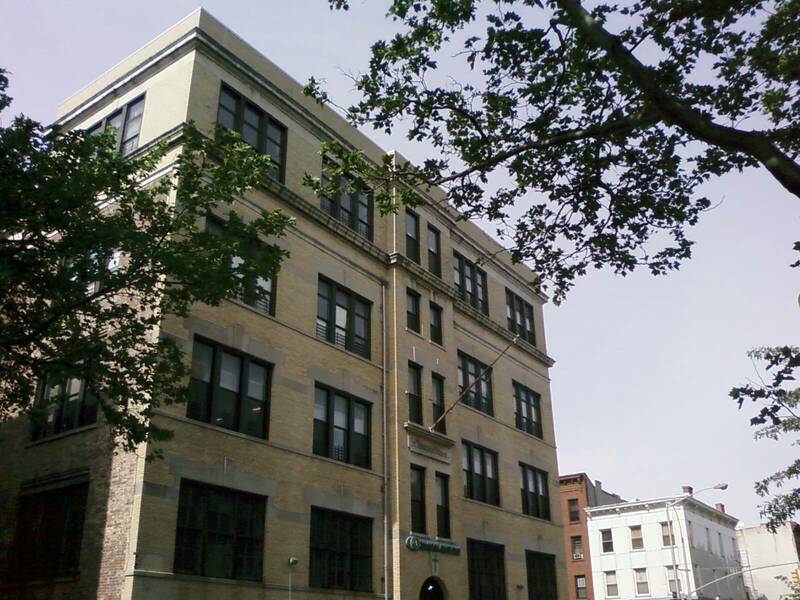 The dormant construction site, which lost its funding/backers when owner Eli Mazon (of Mazon's Discount) was forced to scale his original eight-story, 61-unit building plan down to meet zoning requirements for the location, is also slated to get a mural painted on its construction fence, courtesy of the CHCA. 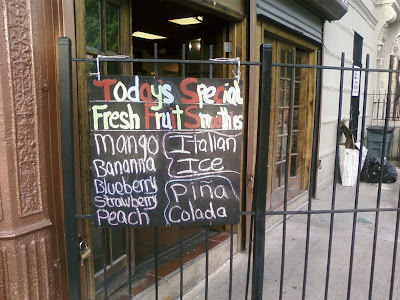 Meanwhile, over on Classon and St. Marks, the tiny urban park is gone as quickly as it arrived, as the management company at the old Jewish hospital makes way for a new coffee shop. Apparently Classon was feeling a little jealous, with only the Glass Shop to compete with the Franklin quadrumvirate (Pulp and Bean, Breukelen, Bristen's, and Lily & Fig). At least you can eat your burger there . . .
Nine months ago, I wrote about the arrival of Cemusa's sleek new bus shelters on Franklin Avenue, one of which sits prominently in front of the booming block just south of St. John's that includes the new Brooklyn Ink Spot, Dutch Boy Burger, and the Breukelen Coffee House. 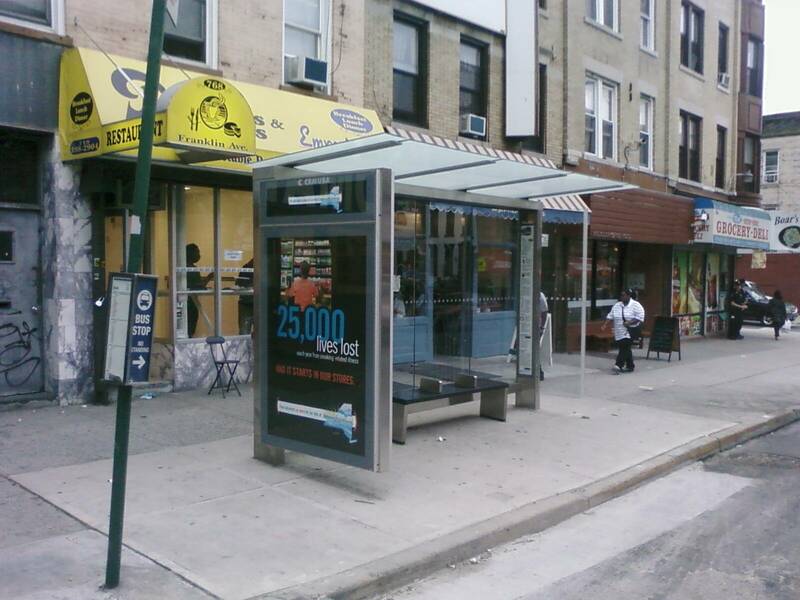 In the original post, I linked an article from the Times' city section (published April 10, 2009) that drew attention to a rather glaring discrepancy in planning: two new shelters were being constructed along the threatened B23 bus route. At the time, the MTA response was that service changes were not definite, but "we will postpone any further installations on affected routes until the situation is clarified" (is it just me, or does this sound like the kind of calm, bureaucratic response that was immediately followed by a closed-doors session with the same bureaucrat's staff in which our unruffled responder threw a copy of the paper on the table and screamed "who the hell approved the new shelters for the routes we're closing?!"). 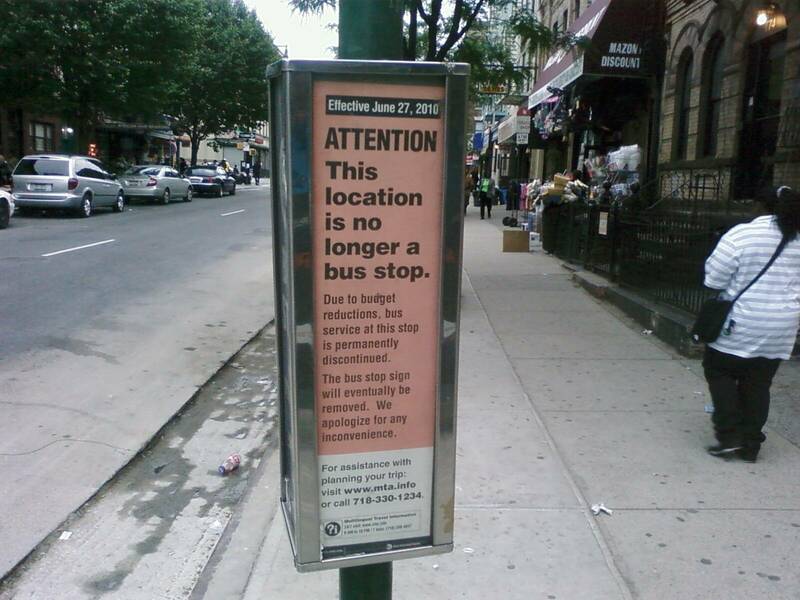 Perhaps this is one of the dangers of privatization--the left hand doesn't know what the right is doing (Cemusa, after all, were paying the city to put the things up, and might have had a marketing plan based on outdated MTA information). Regardless, the Times' vision of "waiting for a bus that will never arrive" has come to pass, not just on the B23 (which was indeed cancelled) but right here on Franklin, where the B48 has been eliminated south of Fulton Street. While I can understand the MTA's logic--ridership is low, in part because the Franklin Avenue Shuttle runs the same route--it's still a loss, as trips north to Bed-Stuy, Clinton Hill, Williamsburg and Greenpoint will now involve hoofing it or a transfer, something that's easy on young legs bus a major hassle for the elderly, who tend to dominate bus ridership because it gets them closer to home and keeps them off their feet. You can read the MTA's official execution announcement here and see a list of affected Brooklyn buses here (my B65 will no longer get me home safe late at night!). In the meantime, as of June 27th, the folks waiting for a Dutch Boy Burger or spilling out of the coffee house will have a nice, sheltered place to sit. The notice at the stop says "this bus stop sign will eventually be removed" but that doesn't make clear what will happen to the shelter. Can Cemusa pull it up and put it elsewhere, or will it remain until some new golden era of transit funding returns it to it's original function? 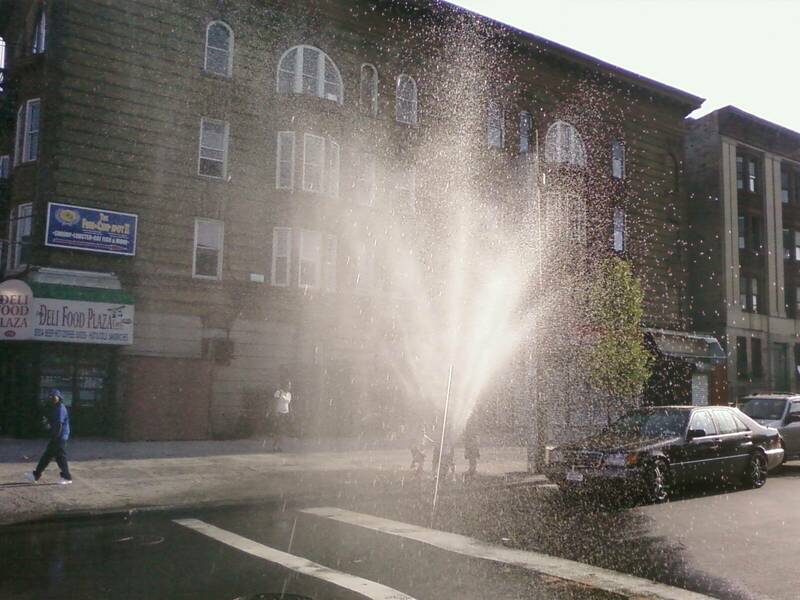 The Crow Hill Community Association, whose members spent this past Sunday cleaning up the vacant lot on Franklin and planting the boxes up and down the Avenue with spring flowers, are hosting their monthly meeting tomorrow night at LaunchPad. The program starts at 7:30 pm and runs between 45 minutes and an hour, with updates on everything from policing to local businesses to the Franklin Children's Fair that's being planned for July 24th. Come by to learn more about our community and enjoy some refreshments from the local cafes. 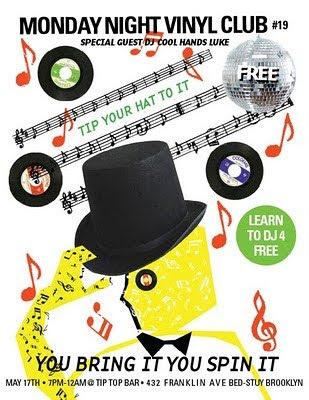 Just a reminder that the Monday Night Vinyl Club will hold court tonight at Tip Top Bar and Grill on Franklin (a few blocks north of Fulton in Bed-Stuy). Check it out if you're an aspiring DJ or you just love a good dance party. Potluck BBQ and Crawfish Boil at LaunchPad tonight! Brooklyn Brainery hosts cheap, collaborative classes on anything and everything, and this Saturday we're throwing a party with LaunchPad to kickoff our new semester and the fact it's officially spring! Everyone's welcome to attend, whether or not you've ever taken a class or ever even plan on it. All proceeds will go toward helping us find a permanent space for the Brainery. You can read more about the event here, and more about the Brainery on our site! • 392 years ago Johannes Kepler called takebacks after rejecting his third law of planetary motion: The square of the orbital period of a planet is directly proportional to the cube of the semi-major axis of its orbit. YES OF COURSE. • Happy Birthday, Treaty of Westphalia! Let's establish our sovereign rights to eat a bunch of crawfish and party down. Congrats are in order for the coffee providers of Franklin Avenue, each of whom has something to celebrate this week. Leading off, Tony Fisher was the Wall Street Journal's Donor of the Day, an acknowledgment he earned by selling a $10 dollar cup of coffee and not keeping a cent for himself. Fisher's brew, which is made from rare Ethiopian longberry mocha harrar beans imported by Gillies Coffee, is apparently one of the tastiest treats a coffee snob can ask for. 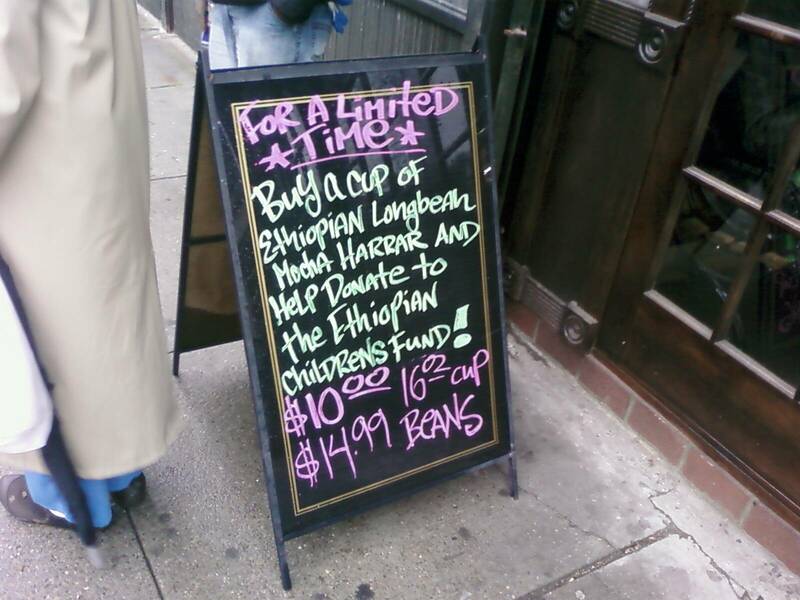 Fisher will donate all the proceeds from the sale of this exotic cup o' Joe will go to the Ethiopian Children's Fund. 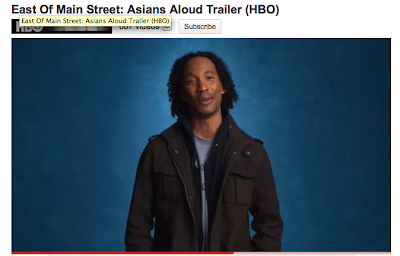 Meanwhile, Jae of the Breukelen Coffee House will be appearing in "East of Main Street: Asians Aloud," a new HBO documentary that premieres this Friday in celebration of Asian-American Heritage Month. 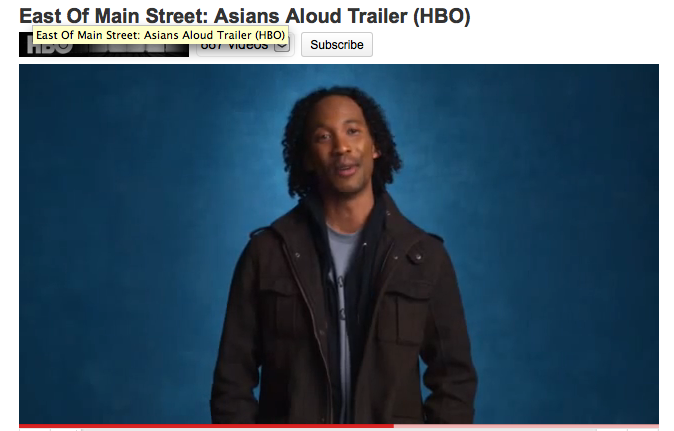 Catch Jae in the trailer here. Penina Roth did it again on Monday, bringing out a fantastic lineup of writers for her monthly Franklin Park Reading Series. Almost as impressive as those on stage were those in the crowd, a gang of NYC literati that included former FP readers Hannah Tinti and Teddy Wayne. Improbably but undeniably, Penina's show has become a destination for NYC authors and readers, and congratulations are in order! Crown Heights' very first writing workshop is for any writer, professional or blossoming, interested in receiving additional feedback on his or her work. The workshop will address short fiction pieces and meet weekly at LaunchPad community center (721 Franklin Ave.) on a weekday evening. The exact day and time will be determined based on participants' availability. Please be able to commit for the entire duration (approximately 6 - 8 weeks). We expect to begin the first session in the next few weeks. Prior workshop experience is not necessary. The workshop will be free! Please e-mail Victoria at CrownHeightsWritingWorkshop[at]gmail[dot]com for more information. 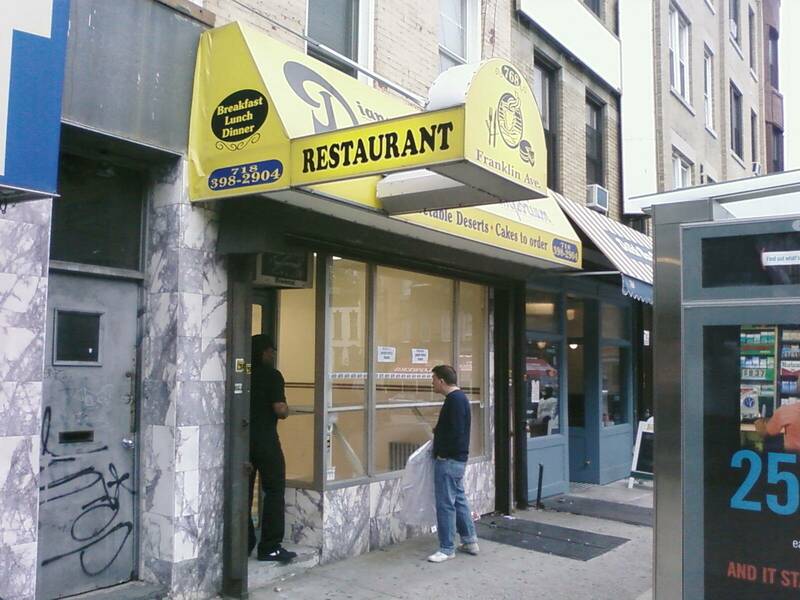 If you haven't noticed it already, the former Diana's Restaurant and Dessert Emporium will soon be home to the second Franklin Avenue location of the Brooklyn Ink Spot. I caught up with Ed, one of their artists, outside the new shop last night, and he told me that they hope to open within a week if all goes to plan. The shiny new space will be primarily for walk-ins and standard body art, while their current location (one of the coolest-looking stores on the Avenue, if you ask me) will become their custom shop. Traffic was backed up to Atlantic on Franklin yesterday as police conducted random stops at Franklin and Bergen. Officers at the scene gave conflicting accounts of the nature of the operation, with one claiming it was a sobriety checkpoint and two others saying it was a response to a shooting that happened "a few blocks that way [pointing southeast] a few days ago." The location also seemed to make tactical sense: vehicles coming south on Franklin were unable to see the police vans until they came around the turn just after Pacific Street, at which point they had no alternative route (Dean was closed to turns from Franklin by an officer on foot). After talking to police about the checkpoint with another passerby, I turned and asked if she'd heard about the shooting (I hadn't, and I still haven't seen anything about it). She said she had not, and with a nod to the scene, quipped "Here we go again, more police harassment." Drivers, unsurprisingly, were equally displeased with the rush-hour checkpoint, and horns and shouts rang down the Avenue. Checkpoints, like stop-and-frisks, are essentially an exercise in playing the percentages, allowing police to trawl through the citizenry in hopes of nabbing someone on the lam. These "random searches" often risk violating 4th Amendment protections against unlawful searches and seizures, though the Supreme Court has allowed certain types, including sobriety checkpoints, on the grounds that the benefit to society from these actions outweighs the damage to individual liberty (a police website reviews different standards for searches here, and the constitutional history can be found here). Nonetheless, arguments about the societal benefits of capturing criminals might be weighed against the fact that such searches are never truly "random," but rather conducted in neighborhoods that are primarily poor and/or non-white. As Bob Herbert, who has been waging a crusade in print against stop-and-frisks, points out, such practices perpetuate tensions and conflict between the police and the young Black and Hispanic men who are the targets of most of these actions. As of today, there was no word on whether the checkpoint resulted in any arrests. 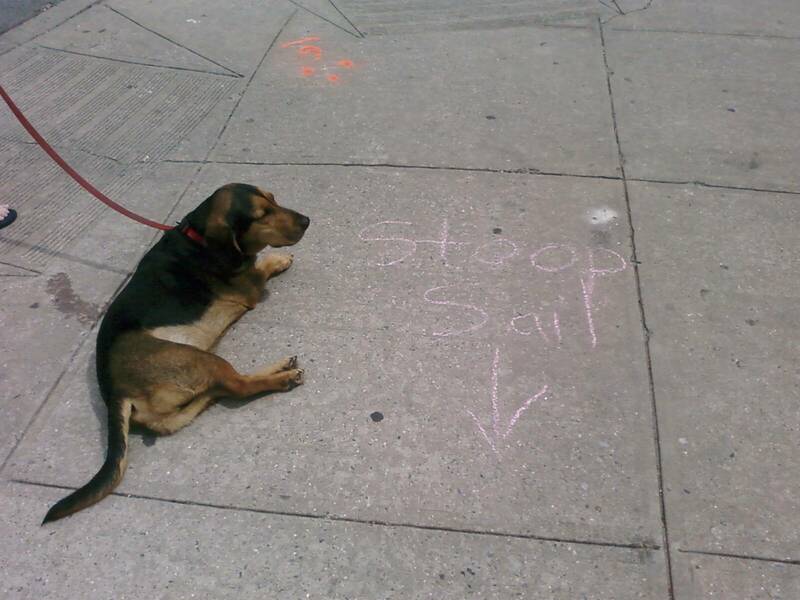 With that, I kick this one to the able comment-writers: Do you approve of checkpoints/stop-and-frisks? Do you think they work? If so, should they be used as often as the NYPD does? 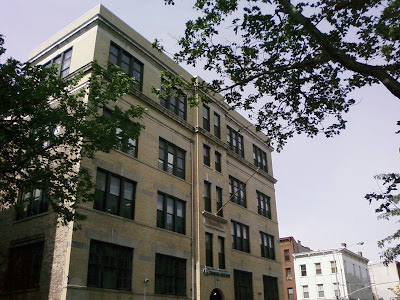 The Dormitory Authority of the State of New York (DASNY) plans to spend approximately $28 million over the next 3 years to turn the former St. Teresa's School complex into a Court Officers Training Academy, to be operated by the state's Office of Court Administration. 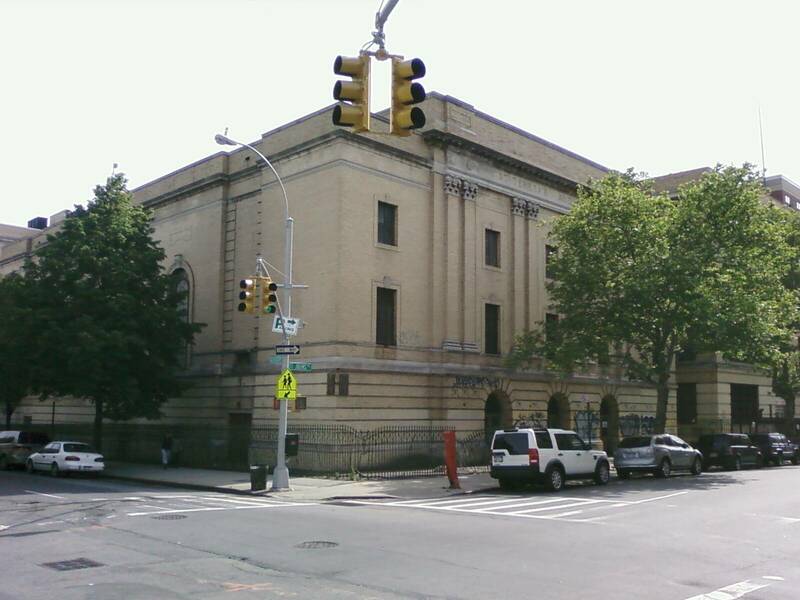 The three structures, which include a sizeable auditorium as well as a former school and convent, sit along Classon Avenue between St. John's and Sterling, one block south of St. Teresa's parish church, with which they were once affiliated. Having housed several different catholic schools since their construction almost a century ago, the buildings will see 53,000 square feet renovated to inlcude "classrooms, multi-purpose/general assembly area, exercise/fitness/training spaces, locker rooms, shower facilities, offices, administrative/office spaces, lodging and dining accommodations" for trainees. For more information on plans, click here. I proclaimed last month's FP Reading Series the best yet, but based on the attention this month's event is getting, that assertion may be dated very soon. Penina's latest edition, "Radicals, Seekers, and Believers," has already been noticed this week by Time Out New York and New York Magazine, and one of her readers, David Goodwillie, has been interviewed in the Wall Street Journal and reviewed in the New York Times. Below is Penina's release for the event (via Facebook), which kicks off tonight in the Big Bar at Franklin Park (remember to enter through Dutch Boy Burger at 766 Franklin). DAVID GOODWILLIE exposes the chilling world of underground radicals in his new novel American Subversive. DANI SHAPIRO reveals her spiritual odyssey in her latest memoir, Devotion. ELICIA BERGER shares stories from her multi-culti childhood. HEATHER KRISTIN recounts a gritty urban upbringing by a Christian fundamentalist mother. DANI SHAPIRO's most recent book is the memoir Devotion. She is also the author of five novels, including Black & White and Family History, and the bestselling memoir Slow Motion. Her short stories and essays have appeared in The New Yorker, Granta, Tin House, Elle, Vogue, Bookforum, Oprah, and Ploughshares, among others, and have been broadcast on National Public Radio. She is a contributing editor at Travel + Leisure and guest editor of Best New American Voices 2010. She lives with her husband and son in Litchfield County, Connecticut. DAVID GOODWILLIE is the author of the new novel American Subversive and the memoir Seemed Like a Good Idea at the Time, for which he was named one of the “Best New Writers of 2006″ by the PEN American Center. He is a regular contributor to The Daily Beast, and his fiction and nonfiction have appeared in numerous magazines, journals, and web sites, including New York, Men’s Health, Black Book, The New York Times, The New York Post, The Rumpus, and Deadspin. He has also played professional baseball, worked as a private investigator, and been an expert at Sotheby’s auction house. A graduate of Kenyon College, he lives and works in New York City. ELICIA BERGER is a freelance writer, editor, and storyteller. By day, she writes smart-sounding things for the United Nations and the Huffington Post. By night, she spews her various neuroses onto the page to delight and appall readers and audiences alike. She can be seen performing in various storytelling shows throughout the city such as RISK!, TOLD, and The Liar Show. To learn about Elicia's upcoming shows, check her out at eliciaberger.com. HEATHER KRISTIN, a graduate of The New School, was born and raised in New York City. She studied at the Summer Literary Seminars in Russia and the Royal Academy of Dramatic Arts in London. Her work has appeared in Glamour, Kirkus Reviews, the L Magazine, New York Press, West Side Spirit, the Russian St. Petersburg Times, on J.T. Leroy’s website, and in other places. She is a two-time recipient of the SAG and AFTRA personal essay awards and is a mentor at Girls Write Now. Currently, she is working on a memoir about being a homeless child and street performer from Hell’s Kitchen. This is a great idea. 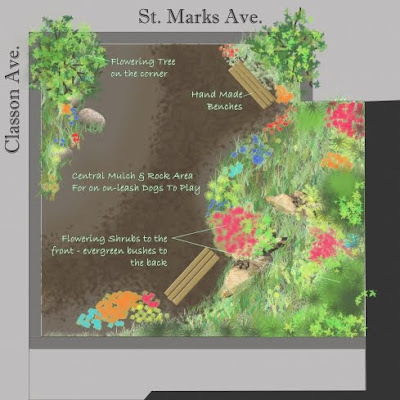 Local architect Lana Zellner has taken the initiative to beautify a corner of our neighborhood, the formerly vacant lot on the southeast corner of St. Mark's and Classon, next to the old Jewish Hospital. Dubbed Tiny Urban Park, the project is already underway -- Lana and her partner Ellen have cleaned, weeded, re-arranged the piles of rocks and concrete in the lot, and even planted the first flowers, as you can see on their blog -- but they need some community support to truly realize their vision (layout above). As LaunchPad did with great success a few months ago, they've started a Kickstarter page and set a fundraising goal of $650, though they could probably use more like $1,000. Nonetheless, this is a VERY small amount for such a huge benefit to the neighborhood, which, based on my extremely complicated econometric analysis (reproduced here) would certainly improve the quality of life by at least a dollar for well over 1,000 people. In all seriousness, think about how nice it would be to have a little park right there, adding color and birdsong and the aroma of fresh flowers and soil to your day, providing a lovely summery place to wait for your laundry to finish spinning next door, and just generally making the area look good. Would you pay a dollar or two to make it happen? Absolutely! So click here and make a donation. One of the very first posts I ever wrote for this site was about the incredible bang-to-buck ratio that communities can reap from vest-pocket parks and gardens like this one, and I remain as much a believer as ever. On that note, mark your calendar for next Sunday, May 16, when the Crow Hill Community Association will be leading a team to re-plant the wooden planters along Franklin in the morning and then clean up the vacant lot at 730 Franklin in the afternoon. Hopefully the CHCA will be able to create another Tiny Urban Park in that space, too. P.S. - For those who clicked the silly link about my econometric analysis, I know that Einstein was a physicist, but he came up quick in my Google image search for "equation" and he's just too cute to pass up. There are some great events coming up this weekend on Franklin -- more to come on all of them, but for now, mark your calendars! 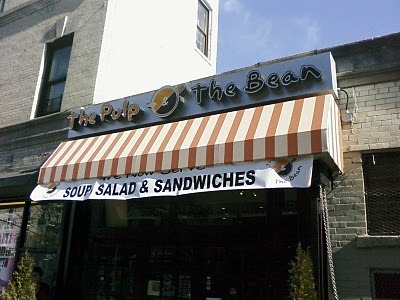 Things kick off Friday, May 7, with the second opening at the Breukelen Coffee House, Breukelen Rebuilt, featuring drinks, tunes, and local artists, while down the block LaunchPad hosts 12 Soloists, a three-hour run of 12 solo performances, each 10 minutes long, from 8pm-11pm. LaunchPad keeps the music playing the next night with Second Saturday Sounds and Songs, a new performance series pairing singer-songwriters with improvisational specialists. This month's iteration features Alex Mallett on the banjo and Josh Sinton on the reeds (you can catch a sneak peak of them rehearsing together here). All three events are free and open to the public, and you can BYOB at LaunchPad. Take mom out to a Dutch Boy Burger Brunch on Sunday and then pick her up some flowers at the Walt L. Shamel Community Garden. Get some sleep, but remember, Franklin Avenue weekends don't end until Monday nights, when the Franklin Park Reading Series, once again a Time Out New York critic's pick, returns! I used to write a post like this once a month, maybe, and if there was an event, it was the only thing happening. Now I have to do a weekend run-down every week, and I can never get to everything. Thanks to all the great people who are making this happen! 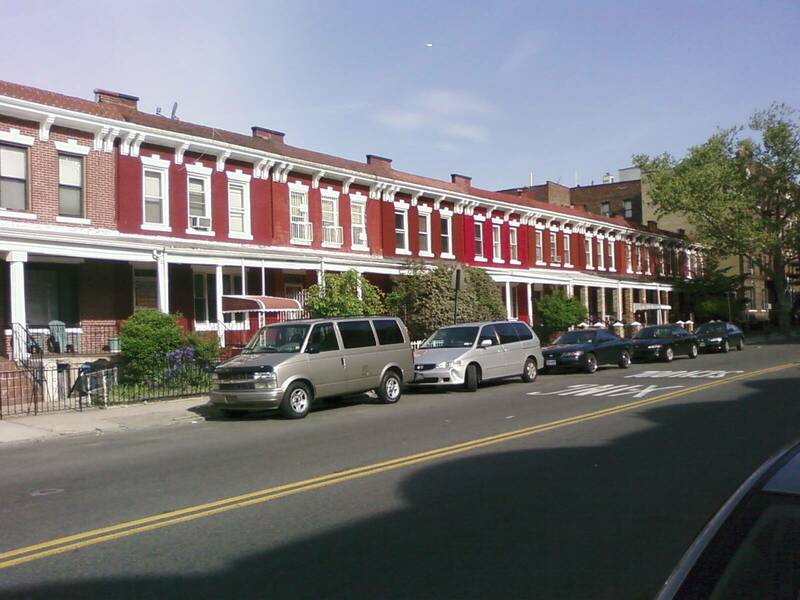 So the first photo is actually from New York Avenue down in Flatbush, but I got a kick out of the different shades of red that each brick row house had been painted. 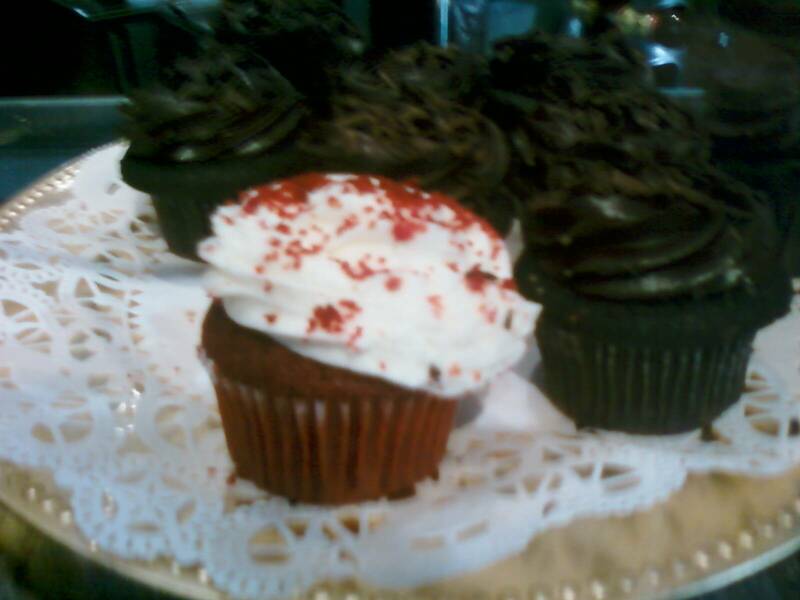 The second photo is to let everyone know that The Pulp and The Bean is now carrying a delicious red velvet cupcake, which means it is possible not only to purchase such a thing on Franklin, but to compare red velvet cupcakes (Lily & Fig also serves one). They're also carrying layer cakes, both in red velvet and blackout (above as well) and in keeping with their Brooklyn-based philosophy, the cakes and cupcakes are all baked at Connecticut Muffin. Meanwhile, Nostrand Park reported today on Lag BaOmer celebrations in Crown Heights, which one could reasonable compare to the West Indian American Day Carnival, only for the Chabad-Lubavitch crowd. For more photos of the festivities, which included a massive bonfire last night and a parade in costume today, click here. The good people of the Walt L. Shamel/Dean North Community Garden on Dean (between Franklin and Bedford) are holding a Mother's Day Plant Sale all this week. 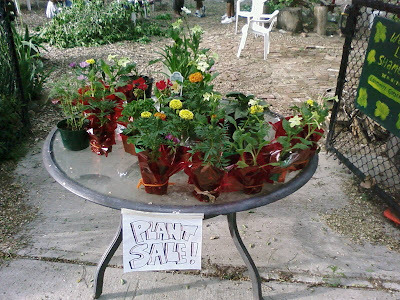 The prices are fantastic: $1 for potted annuals, $5 for combination pots, and $12 for potted perennials. 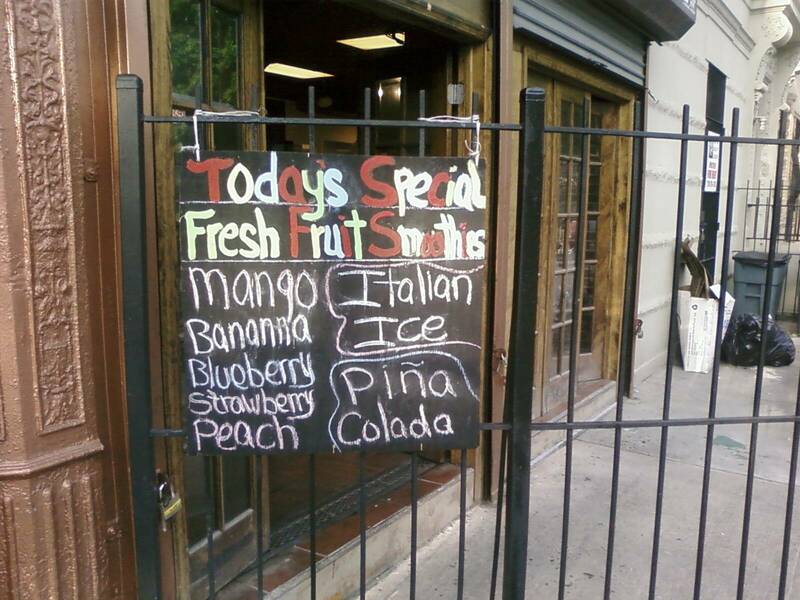 If mom needs a gift, or your stoop just needs sprucing up, swing by.